Now your smartphone can shot Live Photos, which is so interesting that you can't help taking a lot. It helps you capture more than one moment, but 1.5 second before and after that moment, with sound and movement. However, one drawback of Live Photo feature is that, when you try to share it with your friends and families, it will become a still image with only one frame. So how to get the most satisfied frame and convert such video-like pictures to shareable format? In this article, you'll know how to convert Live Photo to PNG or other image formats easily. 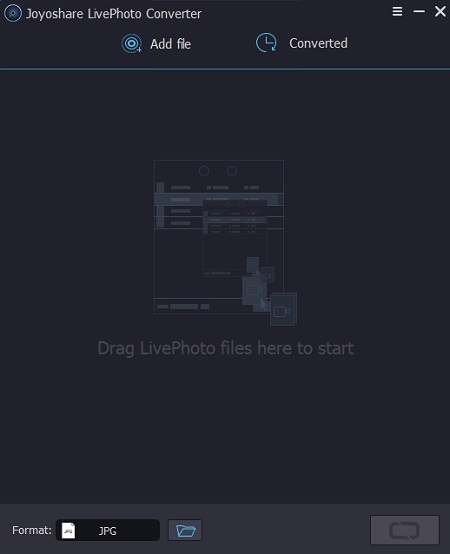 To turn Live Photo to PNG or other shareable image formats, you need a powerful yet easy-to-use Live Photo converting tool. Joyoshare LivePhoto Converter for Windows (or Joyoshare Mac LivePhoto Converter) is exactly what you need. With clear interface and neat buttons, you can easily operate it even if you have never used such kind of program before. 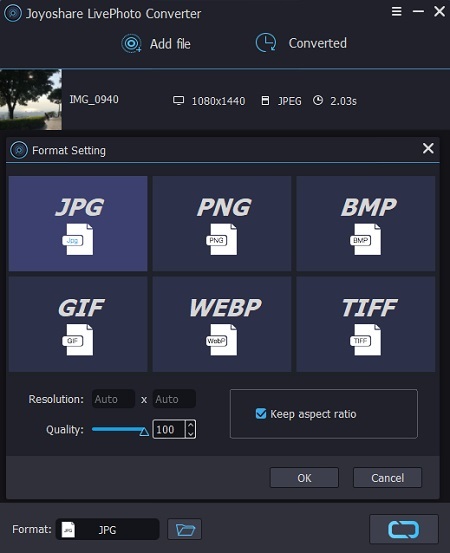 Joyoshare LivePhoto Converter software is capable of converting any Live Photo from iPhone or Android phones to PNG, JPG, GIF, BMP, WEBP, TIFF, etc. in a couple of clicks only. Before conversion, you're allowed to preview the file and choose the most wanted ones from dozens or even one hundred of frames. You can also adjust the output quality, change the resolution, and keep the aspect ratio, etc. according to your preferences. Additionally, this photo converting utility enables users to convert Live Photo one by one or in batch to save time. 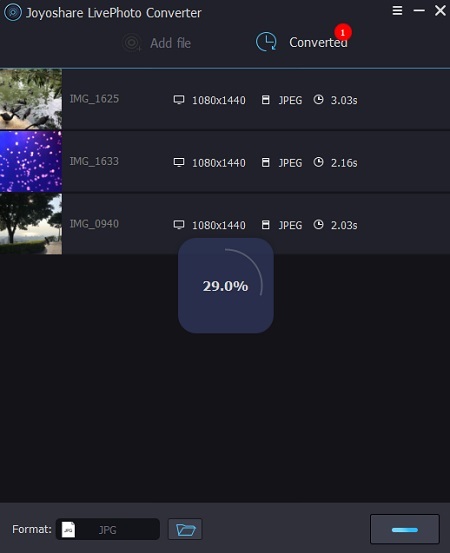 It's worth mentioning that Joyoshare LivePhoto Converter is good at converting Live Photo to still images like PNG, JPEG, etc., but also can turn live pictures to GIF images and thus share with others. So, how can I convert Live Photo to PNG on Windows or Mac? Don't hurry. Now we'll show you the step-by-step guide on how to do it. Here we take Joyoshare LivePhoto Converter for Windows as an instance. First of all, use an original USB cable to connect your device to the PC, and then transfer all your Live Photos you want to convert to the computer. Next simply launch Joyoshare LivePhoto Converter after installation. Now click the "Add file" icon to import all these live pictures or simply drag-and-drop the Live Photo folder to the main interface of Joyoshare. Next click the "Format" panel and select PNG as the output format. Before conversion, you can also play the Live Photo or press the Edit icon to choose the specific frames for conversion. Once all settings are done, it's your time to let Joyoshare start the conversion by clicking the "Convert" button at the right bottom. A few seconds later, you'll see all converted images saved at your computer and you can press the "Converted" button to take a look. 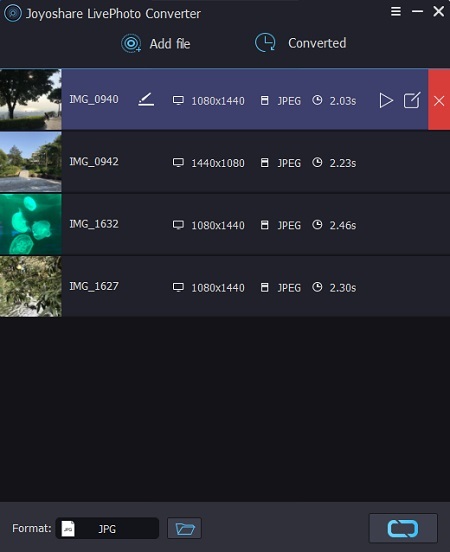 Convert Live Photos to GIF? Fixed!